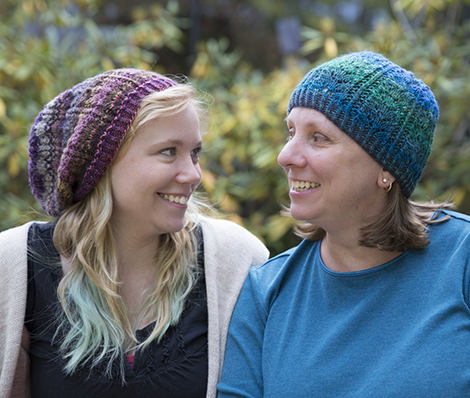 New hat patterns, just in time for fall weather! A twisted-rib brim flows into panels of baby-fern stitch, each separated by a column of single twisted stitches. The crown decreases are worked into the baby-fern stitch panels for a smooth transition at the top. These hats feature Tahki Select Navajo yarn, a self-striping, rustic yet soft, single-ply 100% wool. Pattern includes instructions for two sizes for each hat. The beanie takes 1 ball for either size, and the slouch takes 1 ball for the medium size and 2 balls for the large size. Medium size for each is shown in the photo. 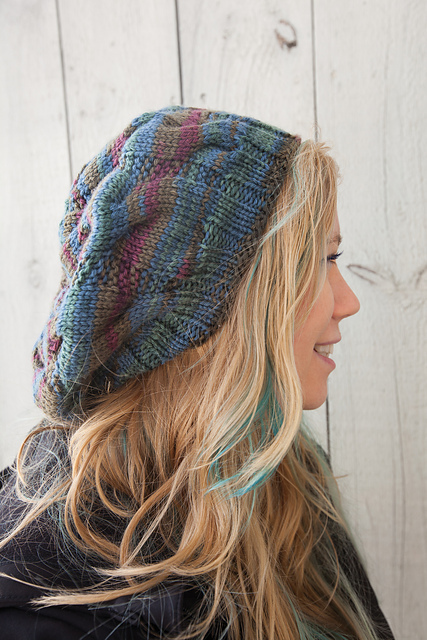 Slouch is shown in color #3, and beanie is shown in color #5. Get all the details on Ravelry, and download the pattern from Ravelry or my blog. And if you’re looking for Navajo yarn, I’d be really, really happy if you ordered it from Patternworks! This little gem was originally the third installment in the Patternworks Essential Accessories club. Now you can purchase the pattern on Ravelry apart from the club. (Clubs are still available – 12 kits, one each month for 12 months – which you can join here!) Hat above is shown in color #3653, Stormy Sea. I. Love. Big. Cables and I cannot lie! This hat has ’em, separated by columns of garter stitch. It features Ty-Dy Wool by Knit One, Crochet Too (one of my favorite yarn companies run by some of my favorite yarny people, in my neighboring state of Maine). Just one ball is all you’ll need! Get all the details on Ravelry, and you can purchase the pattern there, too (you don’t have to be a Ravelry member).